Of the positive feedback I have received from 1888, a great deal of it has been in regards to the character of Annie Chapman. It can be hard to pre-empt just how your audience will feel about your characters but as I was writing, I had a suspicion that something a little bit special was happening on the page. Annie's final day was perhaps the hardest segment of the novel for me to write. It wasn't the murder itself that made those last hours such a gruelling experience to author, but the myriad of small tragedies that befell Dark Annie and kept her from the safety of a doss house that night. One of the rules that I had set myself for the novel was that no one character would have two chapters focused on their stories in a row. This gave me the perfect opportunity to try something a little different with the narrative structure of her final day. Almost every other chapter set on September 7th is from her perspective and each is followed by a different character - meaning that while there are snippets of the other tales of London, we are brought back again and again to yet another humiliation or defeat for poor Annie Chapman as the final few hours of her life run away into night. In many ways Annie Chapman is unique among the canonical five. In many ways she is the perfect example of what they all had in common. The most startling thing to learn about Dark Annie is that unlike the other victims, she came from a comfortably well-off family. 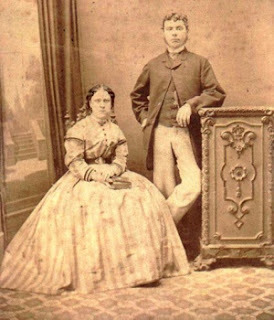 Born Annie Smith, in 1841, not a great deal is known about her formative years but there is every reason to suppose that she would have been educated to some degree and likely capable of reading and writing. She married well to a lower middle class gentleman named John Chapman when she was 29 and the pair lived in a charming terrace house, just south of the river in Westminster, before establishing themselves in a rather grander abode in the prestigious quarter of Berkeley Square. It was here that they had their three children and it is the fates of these children that sent Annie into a spiral to the streets of Whitechapel. The first born of these children, Emily Ruth, died of meningitis aged 12, their third born and only boy, John Alfred, was born crippled and his parents, incapable of coping with him, sent him to live in a home. 1882, finds Annie and John living in Windsor with their nine year old daughter Annie Georgina. John is working as a coachman. 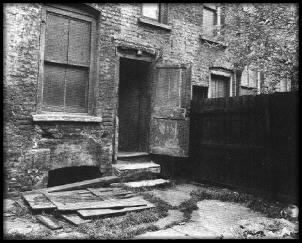 The pair took to drinking after the death of their daughter and by all accounts, their relationship became troubled by violence and illness, resulting in Annie and her daughter leaving the home for Whitechapel, sometime around late 1885. For a while, John supported her, sending money her way every week, but his death from cirrhosis of the liver in 1886 robbed Annie of her only source of income. It is here that Annie Chapman's story becomes much like those of the other four victims; a cycle of alcohol dependency resulting in her resorting to prostitution to support her needs. At the age of fifteen, her daughter Georgina abandoned her, hoping to be able to join the circus in France. Had she waited until the morning, she would have met her regular client, Mr. Stanley. Had the pair not fought the week before, she would likely have been spending the night with him already. (Incidentally, Mr. Stanley's boot fetish is a complete fabrication on my behalf, but many diaries and works of art from that period show that many men at the time had a deep fascination with sturdy footwear on women.) Perhaps if Annie's friend had shared a meal, rather than his beer with her, she would have had enough in her pockets to cover the cost of a bed for the night. 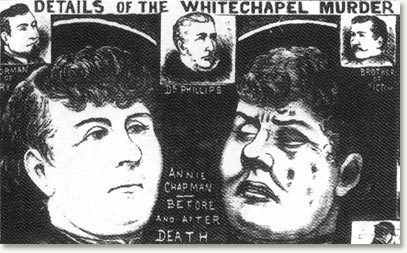 So many possible outcomes of how her night could have ended but like so many aspects of her short life, Annie Chapman's night would end in despair and tragedy.